This is why Buffy never went to Nebraska. What is it? A Buffy-inspired FPS-RPG where you hunt vampires in Nebraska. I sneak up on a vampire—he’s staring off into the distance—and stake him in the head. Strictly speaking, that’s not where his heart is located, but it does the job. Unfortunately, the commotion has drawn the attention of a lumbering behemoth. After a bit of a dance, the giant vampire pummels me and ends my evening of vampire hunting early. I get back to my headquarters and local coffee shop where I am told, unceremoniously, that my home has been burgled. Such is the life of Slayer Shock’s teenage vampire-murderer. As concepts go, Slayer Shock’s is a doozy. Inspired by Joss Whedon’s best TV series (sorry, Firefly fans), by night you’ll patrol the streets of Lancaster, a featureless Nebraskan town, doling out justice to the undead. Fail or succeed, and it’s back to your favourite coffee shop with you, where you can hang out with your very own Scooby Gang—ostensibly free agents who go off on their own missions, attend school, start dating, and break up. The pitch sounds like the perfect panacea for anyone whose life hasn’t felt full since Buffy went off the air in 2003. Lamentably, the reality of Slayer Shock is significantly less seductive. It’s slight, repetitive, and the spectre of procedural generation looms over the experience. Take the randomly generated NPCs: you’ve got your Giles-like mentor and a couple of pals that essentially stand in for the likes of Willow and Xander, but little of what they say or do actually matters. When they date, it just means they’ll sit at the same table until they break up. When their morale is low, it just means they’ll say something gloomy. When they die, you can just replace them with someone else. They merely exist to sell you weapons, upgrades, and to find out where the boss vampire is located. The episodic structure is similarly underutilised. Each mission, where you either rescue hapless hostages, kill Elite vampires, or search for relics, represents a single episode. You can only start one mission per episode, and the areas you choose not to patrol become more dangerous. A season concludes when you—after spending a fair amount of vampire dust, the game’s currency—locate and kill the boss vampires. Then you repeat the whole thing again, ad nauseam. A season concludes when you—after spending a fair amount of vampire dust, the game’s currency—locate and kill the boss vampires. Occasionally there's a wrinkle, like a boss vampire suddenly appearing in a mission just to harass you, or a friend not being around due to exams. That mixes an episode up a bit, but there are few meaningful changes or random events. Episodes and seasons mostly remain identical, pitting you against the same foes in the same missions, with only slight increases in difficulty. The missions themselves, however, while lacking in imaginative objectives, often manage to be entertaining, blood-soaked romps. This all comes down to the combat. You start with a weak stake, forcing you to get right up close to your prey, leaving you incredibly vulnerable. Eventually nail guns, super soakers full of holy water, garlic grenades, crossbows, and almighty katanas make dispatching vampires, and even the occasional werewolf, a lot easier. The swords are undoubtedly the highlight. Fast and efficient, a few slices and all but the hardier vamps are done for. And when coupled with the ability to slide into attacks, leap through glass windows, or stomp on vampires from above, it’s hard not to feel as much of a badass as Buffy herself. On the normal difficulty, once you’ve got a few upgrades, like the ability to carry more weapons, you’ll likely cut through the undead without much bother. They’re not too bright. On higher difficulties, however, Slayer Shock becomes more of a stealth game. The bare-bones UI doesn’t really provide much feedback, so being sneaky requires a bit of common sense and patience—move slowly, crouch, avoid loud noises, stay out of the light. It becomes necessary to avoid groups of vampires, stay behind cover, and make tactical retreats. It’s a very different experience. It’s here, when Slayer Shock stops holding its punches, that we can see the legacy of Eldritch and Neon Struct, Minor Key’s previous games. It becomes smarter, tenser, and the foes that were once just pin cushions transform into serious threats that send you running off to a hiding spot. To survive, the limited vampire movesets should be memorised, and bringing the right tools for the job is key. These bright spots are unfortunately marred by Slayer Shock’s ugly aesthetic and bland, procedurally generated levels. Aside from the occasional box or rare bit of furniture, the maps are depressingly desolate places. There are no traps, no surprises, and an absence of variety persists throughout the seasons. Enemy placement is no better, Foes seemingly wander at random, sometimes all grouped together in one location, at others spread out, walking into walls or crates. 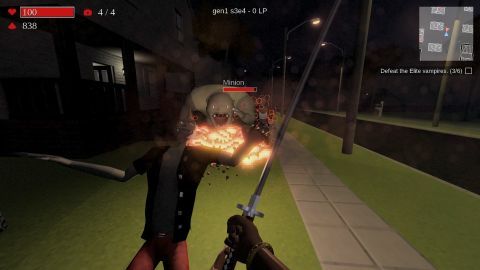 Slayer Shock has no dearth of interesting ideas, from the central conceit to the NPC gang, but few of them are ever taken far, or in interesting directions, leaving it with only the solid combat, half-baked systems, and repetitive missions.